I am a huge fan of Jennifer Brown and have even had the chance to chat with her on my blog. I have read all of her books, except for the book that started it all, her debut novel, The Hate List. I've had this book sitting on my shelf since it's release...What the heck was wrong with me? What took me so long?! Reading The Hate List took me on a very emotional ride. Firstly, let me talk about Valerie's parents. There were moments that I just couldn't handle them...at all! I wanted to shake sense into her Mother, and her father was just terrible. I cannot relate to the horrible tragedy that surrounds the story of this book, but I'd like to think that I would help my daughter grieve and move on from it, and not blame and belittle her. Jennifer Brown is famous for writing though-provoking YA novels that tackle tough and real issues. The Hate List is exactly that. This book raised so many questions for me; some answered, while others left me completely stumped. What would I do? How would I handle this? and so on. I finished this novel over a week ago, and my head is still reeling. I love a novel that leaves me with so much to think about! Valerie was a character that had many sides. She was trying to grieve while trying to move on. She was still in love and yet filled with hate. She was strong yet vulnerable. She was independent but still needed guidance. She was such a bold character and she left in me in tears by the end. Although The Hate List was published in 2010, it still speaks very true to today. Especially during the recent tragedies we are dealing with: San Bernadino and the Paris attacks to name a few. The Hate List will raise awareness about the bullying epidemic and gun control laws. Although it characters are fictional, the subject matter is very true in our world. 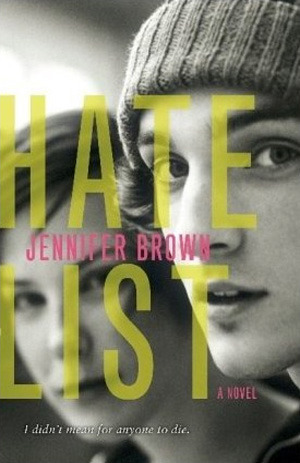 The Hate List was a haunting novel but had a beautiful undertone to it. It faces a lot of tragedy and darkness but the light at the end of the tunnel remains in sight. It is a novel about facing tragedy head on and moving on with everything that you have. A one of a kind read! Although I read it late, it was an epic debut novel. I am so glad I finally read it and would not only highly recommend this novel but every Jennifer Brown novel!